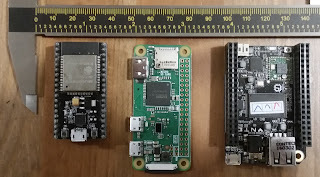 Both the pi zero w and the C.H.I.P support linux. I like the fact that the C.H.I.P comes with on board battery management and audio. The C.H.I.P does not have on board HDMI by default and is a little bulkier than the pi zero w. The pi zero w has built in HDMI and micro SD. The ESP32 board does not run full blown linux but is compatible with the Arduino IDE. The ESP32 supports WIFI and some bluetooth functionality (the espressif SDK does not support pairing yet). Now-discontinued CHIP is the original board, mostly targeting hobbyists. The system is built around the SoC processor R8 from AllWinner as its core, which integrates an ARM CortexTM-A8 CPU (based on ARM architecture V7-A) and peripherals, such as Graphic Engine, UART, SPI, USB port, CIR, CMOS Sensor Interface and LCD controller. The CPU is also accompanied with NEON SIMD coprocessor and has RCT JAVA-Accelerations to optimize just-in-time (JIT) and dynamic adaptive compilation (DAC). The CHIP is 60 mm × 40 mm in size.